If it becomes necessary to start the engine with a booster battery and jumper cables, use a 12-volt booster battery. After connecting battery cables, ensure that they are tightly clamped to battery terminals for good contact. Never add distilled water through the hole used to check specific gravity. The following precautions must be taken to prevent over-discharging a battery. The battery surface (particularly its top) should always be kept clean and dry. The terminal connections should be clean and tight. At every routine maintenance, check the electrolyte level. This also applies to batteries designated as вЂњlow maintenanceвЂќ and вЂњmaintenance-freeвЂќ. Refer to the applicable Instruction Manual for proper battery diagnosis procedures. Never allow battery fluid to come in contact with skin, eyes, fabrics, or painted surfaces. After touching a battery, never touch or rub your eyes until you have thoroughly washed your hands. If acid contacts eyes, skin or clothing, immediately flush with water for 15 minutes and seek medical attention. Failure to do this may cause personal injury or damage to clothing or the painted surfaces. Remove the cell plug using a suitable tool. Add distilled water up to the max level. A battery will be completely discharged if it is left unattended for a long time and the specific gravity will become less than 1.100. This may result in sulfation on the cell plates. To determine if a battery has been вЂњsulfatedвЂќ, note its voltage and current when charging it. As shown in the figure, less current and higher voltage are observed in the initial stage of charging sulfated batteries. A sulfated battery may sometimes be brought back into service by means of a long, slow charge, 12 hours or more, followed by a battery capacity test. Check the charge condition of the battery. 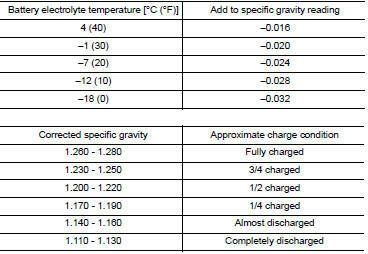 Periodically check the specific gravity of the electrolyte. Keep a close check on charge condition to prevent over-discharge. Read hydrometer and thermometer indications at eye level. 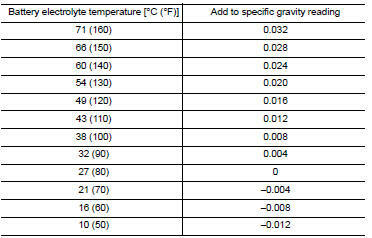 Use the chart below to correct your hydrometer reading according to electrolyte temperature. Never вЂњquick chargeвЂќ a fully discharged battery. Keep the battery away from open flame while it is being charged. When connecting the charger, connect the leads first, then turn on the charger. Never turn on the charger first, as this may cause a spark. If battery electrolyte temperature rises above 55 В°c (131 В°f), stop charging. Always charge battery at a temperature below 55 В°c (131 В°f). The ammeter reading on your battery charger will automatically decrease as the battery charges. This indicates that the voltage of the battery is increasing normally as the state of charge improves. The charging amps indicated above refer to initial charge rate. If, after charging, the specific gravity of any two cells varies more than 0.050, The battery should be replaced.